This tripod features double banded extension legs and large positive locking quick clamp for added stability. Its adjustable center column provides a height adjustment range of 20 in. The adjustable center column also features a metal gear and rack system for smooth continuous motion. Its inner column provides an additional height adjustment of 26 in. 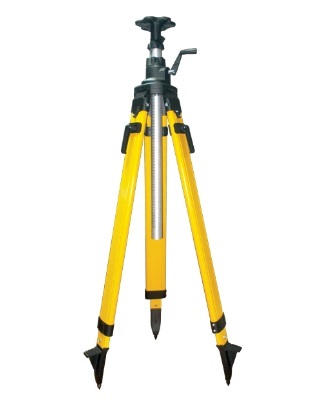 This tripod has a precision machined head and leg hinges to provide a stable mounting base for your equipment. Its die-cast aluminum shoe features hardened steel shoe points that are replaceable. The castings are powder coated for durability and to resist wear. Includes a heavy-duty poly-webbing shoulder strap.